Interbay Yard, Seattle, May 1969. Here we see SD45 GN 425 in run 2 ambling north out of Interbay. I never cared much for the Cascade Green, first seen in 1970, nor the “Big Sky Blue” paint schemes. Add a little dirt and both looked absolutely dingy. This unit was born in the "BSB" scheme, never carrying the magnificent Empire Builder paint scheme. She of course was swallowed up in the big merger transition, and initially painted Big Sky Blue. This period of transition from Great Northern to Burlington Northern resulted in oddities like the the 645 carrying the GN Logo. I think it was done to "educate" the public about the merger. Later, she was repainted Cascade Green, becoming BN 6455. 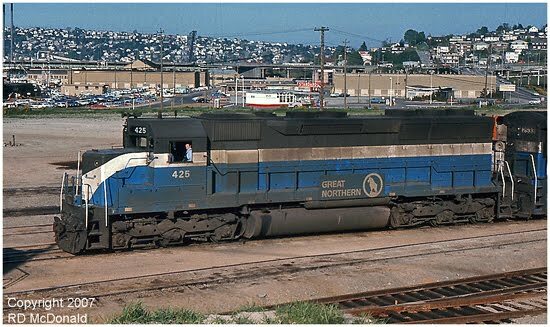 Railroad Stuff: Great Northern 425 built as SD-45, 3,600 hp, July 1968, sn 33792. 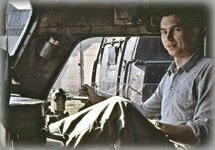 Went to US Leasing in 1983, becoming Chicago & North Western #6574. Rebuilt as Southern Pacific SD40M-2 #86118 in January 1995, becoming Union Pacific #4644. 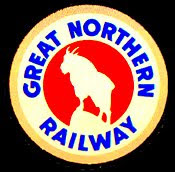 I prefer the Great Northern "Empire Builder" color schemes. But there is an argument to support "Handsome is as handsome does." Consider the "Hustle Muscle." Great Northern owned a handful of SPD45's, carrying a steam generator unit for passenger service. 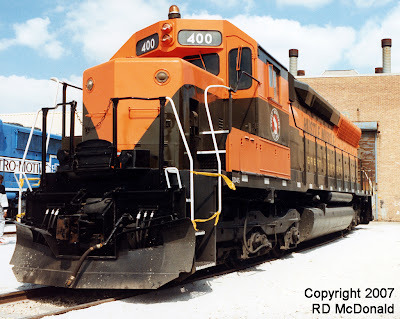 GN 400, was dubbed “Hustle Muscle.” I was fortunate to see her in her Empire Builder colors at the GM Open House in September of 1989. The locomotive display area at the open house, with a dozen or more GM “landmark” locomotives, had pure white gravel spread all over the area, making it a nightmare for photographers! Looking carefully, you can just see the Northern Pacific bridge over the Lake Washington Ship Canal, in the up position, in the background. Railroad Stuff: GN 400, SD45, 3,600 hp “Hustle Muscle.” Built EMD May 1966, sn 31589. Now owned by the Great Northern Railroad Historical Society, on display at the Minnesota Transportation Museum, in St. Paul, Minnesota.